Interplanetary shocks can create "killer electrons" in the near-Earth space environment within 15 minutes of the shock reaching the Earth's protective magnetic bubble. The underlying mechanism for this process has now been revealed as a result of a rare configuration of satellites, including Cluster, SOHO and Double Star. Violent explosions on the Sun can lead to killer electrons in the near-Earth space environment. For decades we have known that our near-Earth space environment is intimately linked to the Sun's activity. However, models of this relationship are still not accurate enough to predict - in detail - the impact on Earth of violent explosions (known as coronal mass ejections) on the Sun. In particular, it is not yet possible to determine where and to which extent a specific region of near-Earth space might be harmful for a spacecraft or perturb sat-nav signals. This situation is rapidly improving. Thanks to an armada of scientific spacecraft, we live in a period of unprecedented opportunity for remote and in situ observations of the Sun and the near-Earth space environment. 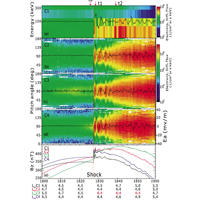 A recent study, led by Qiugang Zong from Peking University (China) and University of Massachusetts Lowell (USA), has investigated the relationship between interplanetary shocks, triggered by coronal mass ejections (CME), and so-called "killer-electrons", and uncovered the underlying mechanism. 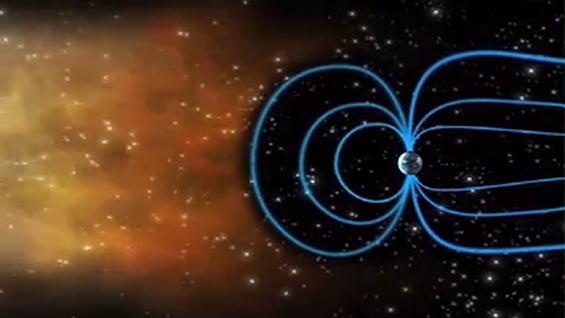 "Killer electrons" are highly energetic particles trapped in the Earth's outer radiation belt. Their name derives from the fact that, due to their energy, they can penetrate the thick shielding of satellites and cause microscopic lightning strikes which damage and sometimes destroy vital onboard electronic components. Theories show that several physical processes can accelerate electrons to these harmful energies; the predominant processes are interaction with waves either in the Very Low Frequency (3 to 30 kHz) domain or in the Ultra Low Frequency (between 0.001 to 1 Hz) domain. Up until recently it has been unclear which process is predominantly at work in the Earth's radiation belts after the impact of an interplanetary shock. On 7 November 2004, a strong interplanetary shock impacted upon the magnetosphere, the Earth's magnetic bubble. The speed and the orientation of the wave front induced by this shock were determined using measurements obtained by instruments on the Cluster and Double Star satellites, along with other satellites widely spread across the magnetosphere. At geostationary altitude, the magnetosphere extends over roughly 84,000 km. Thus, having nine scientific satellites (four Cluster spacecraft, two Double Star spacecraft, NOAA GOES-10 and GOES-12, and the NASA Polar spacecraft) distributed over this large area of space during the impact of an interplanetary shock makes it a rare event to study. "While the constant flow of solar wind particles propagates at an average speed of 500 km/s, the wave front propagation speed was more than 1200 km/s at geostationary orbit (36,000 km altitude) compared to 660 km/s in the plasmasphere", says Qiugang Zong lead author of the paper describing this result. Cluster detected the effect on the Earths magnetosphere of the arrival of an interplanetary shock. Image courtesy of Q.-G. Zong. For this event, the amount of energetic electrons in the outer radiation belt started to increase almost immediately after the shock arrival. This substantial rise of "killer electrons" is found to be caused by a two-step process: The initial acceleration is due to the strong shock-related magnetic field compression. Immediately after the impact of the interplanetary shock, its passage across the magnetosphere triggered the Earth's magnetic lines to wobble at Ultra Low Frequencies (ULF). In turn, these ULF waves were found to effectively accelerate seed electrons, provided by the first step, to become "killer electrons". "Both VLF and ULF waves accelerate electrons in the Earth’s radiation belts, but with different time scales. The ULF waves are much faster to do that than the VLF, due to their much larger amplitudes. They can explain the short time interval between shock impact and electrons being accelerated up to harmful energies", says Zong. "Data from the four Cluster satellites allowed the identification of ULF waves able to accelerate electrons", says Malcolm Dunlop, Rutherford Appleton Laboratory, Didcot (UK), and co-author of this study. "The Cluster constellation was also key to estimate the time needed for seed electrons to become ‘killer electrons’, after only 15 minutes!" added Zong. "These new findings can help us to improve the models predicting the radiation environment in which satellites and astronauts operate. With solar activity now ramping up, we expect more of these shocks to impact our magnetosphere over the months and years to come", says Philippe Escoubet, Cluster project scientist at the European Space Agency. "Fortunately", he added, "even after almost 10 years in operation, the Cluster satellites are in excellent condition and can continue to quantify these effects". Cluster is the first space mission able to study, in three dimensions, the natural physical processes occuring within and in the near vicinity of the Earth's magnetosphere. It is a project of international collaboration between ESA and NASA. Launched in 2000, the Cluster constellation is composed of four identical spacecraft orbiting the Earth in a pyramidal configuration, along a nominal polar orbit. Cluster's payload consists of state-of-the-art plasma instrumentation to measure electric and magnetic fields spanning a wide-range of frequencies, and electron and ion distribution functions from energies of nearly 0 eV to a few MeV. The science operations are coordinated by the Joint Science Operations Centre (JSOC), at the Rutherford Appleton Laboratory (UK), and implemented by the European Space Operations Centre (ESOC), in Darmstadt, Germany. Double Star is the first mission launched by China to explore the Earth's magnetosphere. The mission consists of two satellites, each designed, developed, launched, and operated by the Chinese National Space Administration (CNSA). Eight of the 16 instruments carried on each spacecraft have been provided by European research institutes, the other eight by Chinese institutes. ESA funded the refurbishment and pre-integration of the European instruments, and provides data relay support with its Cebreros ground station in Spain.